Orionids Meteor Shower: What is it and can I see it? A powerful meteor shower is expected to light up British skies tonight with "a natural firework display", astronomy experts have predicted. The meteors can be seen by the naked eye and are the result of material falling from the tail of the Comet Swift-Tuttle. Professor Alan Fitzsimmons of Queen's University Belfast explained: "Comet Swift-Tuttle won't be visiting our neck of the woods again until the year 2125, but every year we get this beautiful reminder as the Earth ploughs through the debris it leaves in its orbit." [It] looks to be a fireball that moved roughly toward the South East, going on visual reports. Judging from the brightness, we're dealing with something as bright as the full moon. The thing is probably a yard across. We basically have [had] a boulder enter the atmosphere over the North East. The reports are consistent with a meteor that hit in Russia's Ural Mountains last month, only smaller. I actually heard the #meteor today as well. It was making almost a hissing noise as it flew brightly overhead. I saw it around 7:55pm EDT. 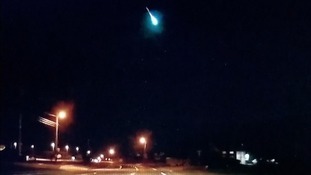 Footage distributed by WUSA shows a meteor clearly visible in the sky on the US east coast. This security footage obtained by NBC News and shot in Thurmont, Maryland, shows the meteorite flash in the sky last night. The American Meteor Society has verified over 300 witness sightings of a meteor in at least 13 US states. Stretching from Ontario down to the southern state of North Carolina, there are still over 100 reports yet to be reviewed, said Mike Hankey, an observer for the American Meteor Society. "This was most certainly a fireball seen over a good portion of the eastern states," said Robert Lunsford, the society's fireball coordinator. "It happened at a good time, around 8 o'clock on a Friday night, when a lot of people were out to see it," Lunsford said. A NASA scientist has told the Associated Press that social media reports of a meteor on the US east east seem to be consistent with the behaviour of a meteor shower. Donald Yeomans, manager of NASA's Near-Earth Object Program in California, said: "it's unusual to have so many people see it." Bloomberg News has reported that there have been sightings of a possible meteor, seen on the US Eastern Seaboard. FLASH: Reports of a possible meteor seen on U.S. Eastern Seaboard; sightings from upstate New York to northern Virginia. Chillingly we spend more money on making movies about rocks that can hit the earth than we do about looking for the actual rocks. We send a whole lot of people who normally spend their time painting the whole surface white, over a few years that pressure might nudge it off by a few thousand kilometres over a few years and that would just miss us as opposed to just hitting us. If we have less time, then we have to think about getting up there with rockets. Pushing the rockets hard against the rock and then firing it and trying to nudge it off with sheer Newtonian mechanics.